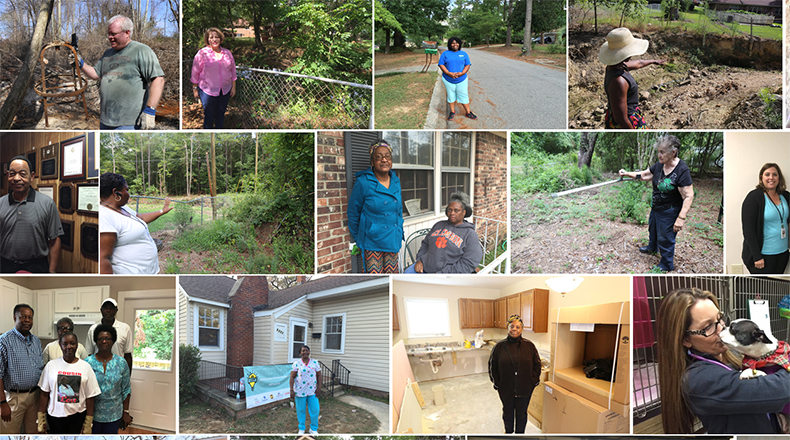 Lou Alice James is the 200th homeowner to receive assistance from the Midlands Flood Recovery Group. Here, she clings to the one family heirloom that survived the mold, a crystal candlestick that belonged to her grandmother. AmeriCorps volunteers cut into the cake celebrating Lou Alice James' upcoming return to her flood-damaged home. Lou Alice's home has been uninhabitable since it sustained serious damage from the flood of October 2015. After the Saint Bernard Project finishes repairs, Lou Alice will be able to return home. Listen. Coverage of South Carolina flood recovery is made possible in part by a grant from the Corporation for Public Broadcasting. United Way of the Midlands spearheads the Midlands Flood Recovery Group, which focuses its efforts in Richland and Lexington counties. organizations have supported vulnerable flood survivors through many aspects of recovery, including repairing severely damaged homes like this one in Columbia. The group hosted an event to celebrate the milestone in backyard of their 200th aid recipient, Lou Alice James. Rachel Pettit, Executive Director of the Saint Bernard Project (or SBP, the MFRG partner which has overseen the repairs to Ms. James’ home), introduced the homeowner to the gathered crowd. I may have lost all my material things in that home, but I can tell you one thing: I'm still alive, and I thank God for that! For Lou Alice, this day was indeed a long time in the making. Her home was so severely damaged by flooding that it was rendered uninhabitable. As a result, she has spent two years nomadically moving between the homes of various family members, not wanting to burden any one of them for too long. Though grateful for the help her family has given her, she has sorely missed her independence. “I like the idea of having my own, so I can go in there and I can do what I like to do!” Lou Alice said. When her house’s repairs are complete, returning will mean more than just steady housing for Lou Alice. This house has been in her family for many years, and was passed down to her from her mother. All of the family heirlooms in the house were destroyed by mold, save for a crystal candlestick that belonged to her grandmother, which Lou Alice clutched throughout the 200th Home Celebration. However, like other recipients of aid from MFRG, Lou Alice was financially unable to repair the home herself. Since a diabetes-related disability took her out of the workforce several years ago, she has lived on only about $400 a month, according to SBP. Sara Fawcett, President and CEO of United Way of the Midlands, says that many more homeowners like Lou Alice still await assistance. “There’s at least 600 other homes that we know that are low income homes that are in need of repair, that have had little or nothing done to them, or where a family may be living in a home that’s in substandard condition, so that’s the work that really has yet to be done,” she said. Pettit added that SBP alone has 50 clients waiting to hear the status of their own reconstruction projects. High school volunteers for the Saint Bernard Project traveled from Saint John's School of Ontario, Canada. 200th Home Celebration, it was hard to miss the group of boisterous teenagers who had traveled all the way from Ontario, Canada to volunteer for the Saint Bernard Project as a school mission trip, all wearing matching SBP t-shirts and belting out a giggly rendition of “O, Canada!” One of these young volunteers, Fitzy Pratt, reflected on what the experience had meant to him. “It’s just . . . insane to see that there’s people that still, like two years later, are living like this . . . and it feels nice to know that we came here and made a difference in their lives,” he said. Two years ago, Mary Burch watched and prayed as heavy rains caused the underneath of her family home to flood and eventually rot. 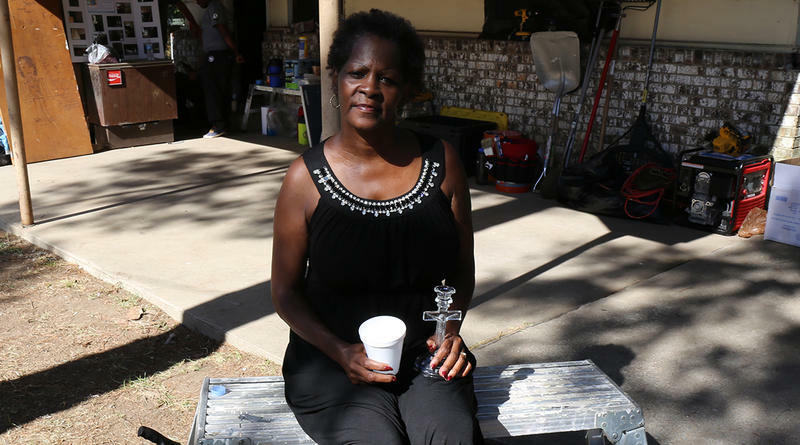 Months later, the 77-year- old Sellers resident was living in unsafe and unsanitary conditions as mold started to grow and the structure of her homw was compromised from the flood. The week of the two-year anniversary of the October 2015 flood, Burch was able to walk through her near-finished new home.